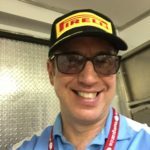 After 2 years away from racing, and after overcoming a serious health challenge in 2015, Carlos Tesler-Mabe made a comeback in motorsport racing at the Canadian Touring Car Championship. 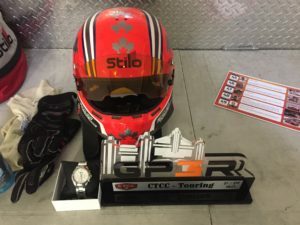 SCCBC’s Tesler-Mabe recorded a second place finish in Touring Class at the historic GP Trois Rivieres street course Canadian Touring Car Championship rounds 7-9 August 11-12, 2017. 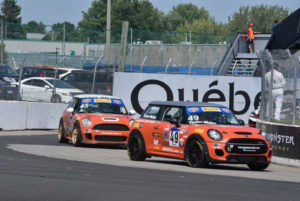 Race 1 was a night race in front of a full crowd at Trois Rivieres where Carlos finished fourth despite running third throughout most of the race. Race 2 was a wet race where he finished in his starting position, second place, on the podium, right behind team mate Michel Sallenbach. In race 3 Carlos was caught in traffic as a result of an accident and dropped to the back of the touring class field. He fought back 6 positions to pass on the last corner of the last lap after a restart, and finished a strong fourth. Carlos would especially like to thank his racing colleagues at the SCCBC.